In the Flora of Australia, information on plants is arranged into taxon profiles. Each profile comprises up to five tabs: ‘Profile’, ‘Distribution’, ‘Gallery’, ‘Literature & links’, and ‘Key’. Most of the information is in Profile, which usually has information on: the taxon’s name, the botanical description, any illustrations, notes, distribution, the source citation for the information, habitat, specimens examined, phenology, and taxonomy. The distribution tab contains a map, and literature & links tab may provide more information on that taxon. The treatment of each family begins with the family name, including the author of the name and citation. For flowering plants it must be the name used for the family in the Australian Plant Census. Similarly, the treatment should contain the Australian genera included in the Australian Plant Census. The family description should describe the family as a whole, but have a focus on Australian content. Attributes that occur only outside Australia normally have the qualifier ‘(not in Australia)’. Such qualifiers may be necessary, for example, if Australia has only a few species of a large family. The description should contain all the characters needed to understand the generic descriptions. If a family or character has one or several attributes that are common and others that are rare it is often worthwhile to say so, for example, ‘Leaves alternate or rarely almost opposite’. In the description of a genus, plant parts (organs) are described in the same sequence as in the family description and cover characters that distinguish the genus from related genera. It may repeat attributes that are consistent in the family. Where the family description includes various possible states (e.g. leaves alternate, opposite, whorled or otherwise), then the state that applies to the particular genus should be described. For example, in the Solanaceae, Fl. Australia 29: 1–208 (1982), the family description begins ‘Herbs, shrubs or small trees’, and the first genus, Anthocercis, is characterised in habit by ‘Shrubs’. This is the current name in the National Species List (incorporating the Australian Plant Name Index and Australian Plan Census lists). This follows Flora of Australia protocols. Key words are in italics (especially in more recent profiles). Terminology follows the Flora of Australia glossary. These are the features that enable identification of the taxon, particularly with respect to its closest relatives or morphologically confusing taxa. A diagnosis may be brief, and focus on only one or two characters. Information on seedlings may only be available for relatively few taxa. Ideally, such information describes the cotyledon stage, tenth leaf stage, and indumentum (appendages of the epidermis). This field is used for profiles above species, and includes the number of genera and species and their distribution worldwide as well as within Australia. If known, estimates of abundance are provided for native, endemic and naturalised taxa. Information on the worldwide distribution is not applicable for endemic families (those found only in Australia). This field is used for profiles at species level and below, with information on the general distribution within Australia and globally (if applicable). The region of origin is specified if the taxon is not native to Australia. This refers to whether the taxon is native, naturalised, or both. The term ‘and cultivated’ is also added if appropriate, as is whether the taxon is a declared pest plant or Weed of National Significance. This especially applies to taxa currently or historically listed as threatened under Commonwealth, and/or state or territory legislation. Other relevant information includes the land on which the plant occurs (e.g. whether conservation reserve, etc.). The result of any assessment by the IUCN may also be included in this field. General habitat information such as vegetation, geology, or soil type. Common co-occurring taxa are included if there is a strong association. This comprises notes on specific ecological aspects that are relevant to the plant’s taxonomy or biology, e.g. species-specific interactions with pollinators, fungi, or herbivores. This refers to timing of flowering and fruiting. Month(s) are more precise than season(s). The qualifier ‘mainly’ is used if there are unusual records or outliers. Information such as: related taxa, unusual specimens, doubtful specimen or literature records, different taxonomic concepts, any infra-taxa (those at a lower rank). This attribute includes the nomenclatural type name for taxa above species, or specimen(s) for a taxon name and its type status. Barcode numbers are included for sheets where applicable. These are sourced from the National Species List based on the taxon concept in the Nomenclature section. These are notes relating to typification. Names of uncertain status, or excluded names that are not listed as misapplied against specific taxa are listed here. Etymology as used here is the derivation and meaning of the taxon’s name. This presents the original words and language from which the epithet is derived, and where known, why this has been applied to the taxon. The original paper in which the taxon was described is the best source of such information. This is a list of the common names in regular use in Australia. Many taxa do not have common names if they are not widely known. Common names are normally qualified where they are used for one species in a state or region but refer to a different species in another state or region; for example, the Tasmanian blue gum. Where Indigenous names are used, the group/language from which the name is derived is usually included. Reported as n = __. A reference (author, date) is included if available with details in the bibliography, or a voucher specimen for novel counts (collector, number, herbarium). This is for information not taxonomic in nature; for example, whether the fruit is poisonous/edible). If the taxon contains plants of major economic importance they are also referred to here. This is the original source of the majority of the content of the profile. Reference/bibliographic information on published illustrations. This is the taxon concept on which this name is accepted according to the Australian Plant Census. HTML links to other relevant information (e.g. PDF files containing open access taxonomic revisions). Other links include type specimen images on JSTOR Plants or other databases. Ideally, URLs are those that are unlikely to change (e.g. a search string or permalink). This is a list of selected (generally 5-10), relevant specimens examined that are representative of each state/territory. Locality data can be generalised to the nearest primary location provided on the collection label, and latitude/longitude is normally excluded. Link to original protologues and taxon treatments in publications available through the Biodiversity Heritage Library (BHL): (http://www.biodiversitylibrary.org/). References to cited publications and further information, especially those sources consulted in preparing the taxonomic treatment. Additional images (photographs, line art, Scanning Electron Micrographs, etc. ), with caption information and permissions for use. This can include video files if appropriate. The name of the profile author or individual field contributor is recorded in the ‘authors and acknowledgements’ field. Full names and initials are provided as normally written (e.g. Ferdinand J.H. Mueller). Multiple authors are separated by a single semicolon, e.g. ‘Christopher M. Palmer; Laurie A.S. Johnson’. Rather than being included as text within profiles, identification keys are being managed through KeyBase: http://keybase.rbg.vic.gov.au/. 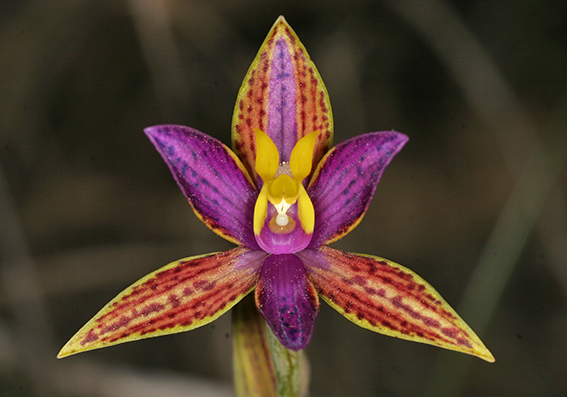 More information on using taxonomic keys can be reached via the ‘Identify’ button on the Flora of Australia homepage.